What does this tell your heart and mind? Little bundle of joy Leo David Hargreaves could just be the cheeriest baby in the country, according to his parents. 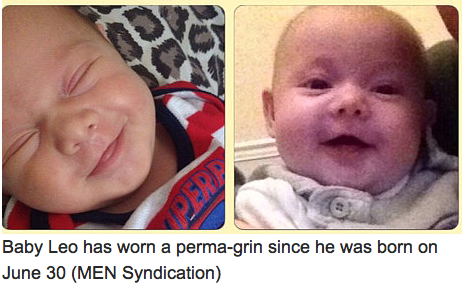 Not only does the five month-old smile all the time, he’s been smiling since before he was born. 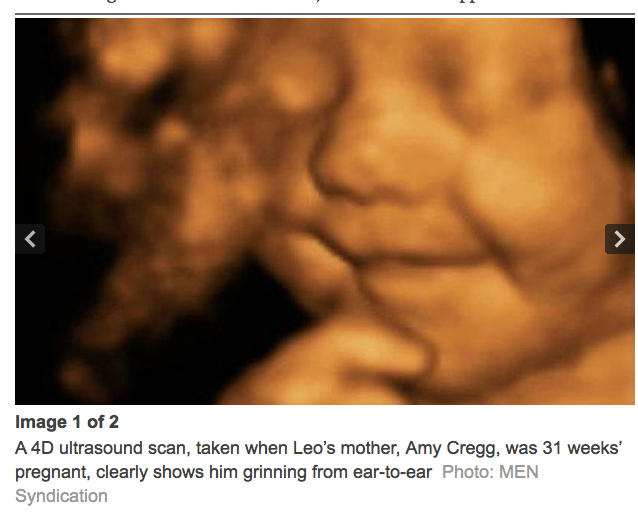 A 4D ultrasound scan, taken when Leo’s mother, Amy Cregg, was 31 weeks’ pregnant, clearly shows him grinning from ear-to-ear. Miss Cregg, 24, and her partner Leighton Hargreaves, of Church, Accrington Lancashire, say that baby Leo has continued to wear a perma-grin since he was born on June 30. Modelling companies, and Next, the high-street fashion chain, have already been in touch with the couple to express an interest in signing-up Leo’s winning grin. Miss Cregg, a rehabilitation support worker, said: “Leighton and I were absolutely shocked – even the people who did my scan were amazed. But Miss Cregg and Mr Hargreaves, a painter and decorator, say there’s no rush to put pen to paper. The 4D scan – which captured gender, growth and the weight – was taken at Babybond Ultrasound Direct clinic in Burnley. A spokesman for the clinic said: “Our sonographer who scanned Amy and her gorgeous baby was overwhelmed at her smiley baby throughout the entire scan.